Two different aspects are easy to notice: on one hand Verona was the focal point of painting and on the other it was a model for modern military architecture: elegant palaces which date back to the Renaissance and the Baroque centuries,impressive frescoes and decoration were built alongside unassailable city walls and fortifications. Look one way and Verona shows itself as a prosperous merchant city,look the other way and you notice the fortified military outposts: come see for yourself the two-faced city of the venetian era. This tour starts with a bus tour in order to have a look at the venetian city walls, which were built exactly where the walls of the middle ages were. The symbol of the new walls are three imposing entrance doors: Porta Nuova, Porta Palio and Porta San Zeno are impressive buildings by the architect Michele Sanmicheli and are the perfect introduction to Verona in venetian times. As we cross the medieval bridge of Castelvecchio we will fill you in on the history leading to the year 1405 when Verona became part of the Venetian Republic and walking along Corso Cavour you will admire some of the most impressive examples of renaissance and baroque architecture in town: Palazzo Canossa and Bevilacqua, by the afore mentioned Michele Sanmicheli, Palazzo Carlotti,the façade of the painter Giolfino’s house and all this is only an introduction to what you will see in Piazza Erbe! 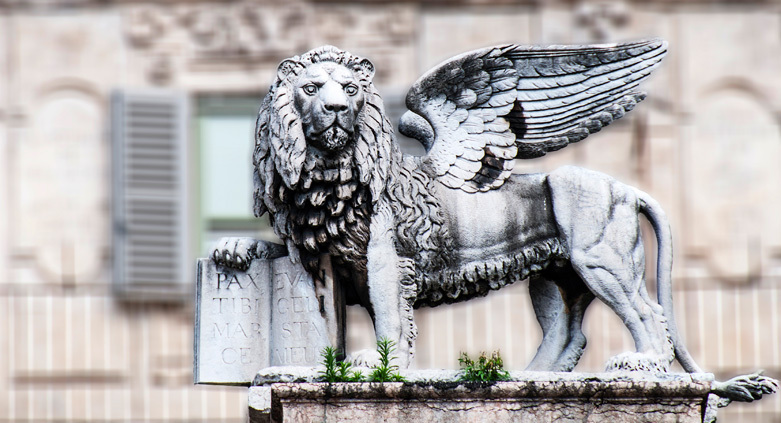 Entering the square you will immediately see the winged lion, symbol of Venice, and nearby the elaborate Palazzo Maffei. 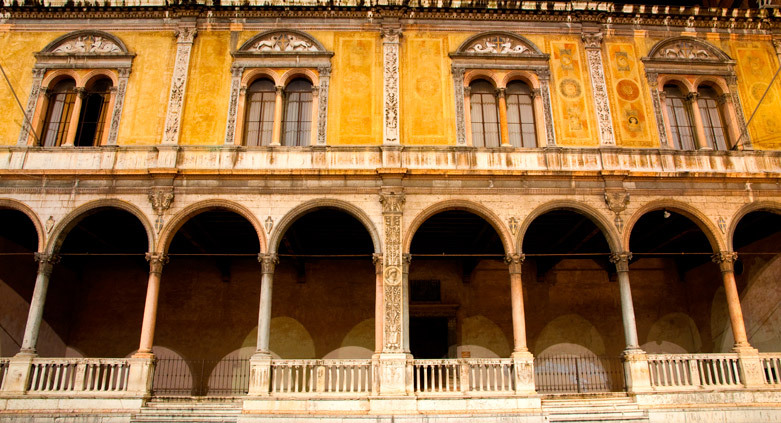 Verona in the past was called ‘urbs picta’, the painted city and here you will understand why: many façades still are conspicuous thanks to their frescoes depicting religious or mythological scenes. The Mazzanti’s house is surely the best example of the wealth spent by the various families for this lavish decoration. 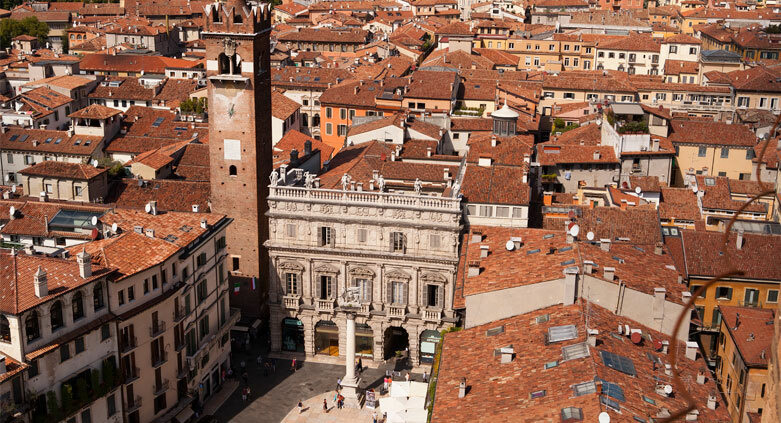 In the center of the square the small building is known as the ‘pillory’ and in the year 1405 the seal and the keys of the city were handed to the Venetian representatives… the beginning of Venetian rule in Verona. We walk on to Piazza dei Signori, political and administrative center of the city also under Venice. Look around and you will see various statues: Girolamo Fracastoro, a famous doctor and the learned Scipione Maffei are among those represented. Many buildings of different ages are to be seen and one of these belongs specifically to this tour: the Loggia del Consiglio, built at the end of the XVth century, is a perfect example of Renaissance architecture. Many narrow streets lead us to the Cathedral of Verona. The first construction goes back to the IVth century AD, but in Venetian times it was transformed into one of the most beautiful symbols of ‘painted’ Verona. The interior is rich in paintings by local and foreign masters and the architecture blends with the frescoes. To finish our tour we head towards Piazza Brà to see the many elegant buildings surrounding the gardens and admire also the façade of the Gran Guardia: it used to be the military accademy for the noble venetians and was started in the XVIIth century AD. *Some parts of our tour have uneven surfaces and there are few steps along the way. Only steps reach parts of the Cathedral. BUS: check out www.amt.it for entrance fee to the city and parking fees. THIS TOUR IS AVAILABLE IN: Italian, English, German, French, Spanish, Russian, Portuguese, Finnish and Japanese. Ask for the language you are interested in. TO COMPLETE YOUR DAY: Basilica of S. Zeno, Church of S. Anastasia, Church of Santa Maria in Organo, Museum of Castelvecchio, 'Painted Verona'. FOR WHOEVER HAS AN EXTRA DAY: Verona, Lake Garda, Soave, Valpolicella, the Rice Road Tour.